Yesterday I ran the Wrightsville Beach Half Marathon for the third year in a row. A local race that starts less than ten miles from my front door, it offers a full and a half option, but I've always opted for the half. (And will continue to do so, since the full course seems repetitive). The race begins at the beach, includes two bridges that you cross during sunrise, and ends along a busy road (cordoned off for the race, of course) lined with spectators, funny signs, and plenty of dogs. (Nathan counted 51 spectating dogs during the race; I lost count after the first eight because I was too busy trying to maintain my pace). As usual, our training for this race was sub-par. Every year I swear that I will run at least three times a week, do speedwork and tempo runs, and smash my PR. Every year I run maybe twice a week, do a little bit of speedwork, and cross my fingers. I used to race and run a lot more, in my mid-twenties. I'm not sure if my desire to do things other than run (such as a drink an afternoon beer, read a book on the back porch, and watch Netflix) is a sign that I am too busy for all that running, or just too lazy. Either way, the idea of running a marathon these days seems insane. You can phone in the training on 13.1, but 26.2 is not so forgiving. Though maybe it's me who needs to be more forgiving, because - spoiler alert - I managed to PR yesterday! I suspect this is because, even though I am not running as much as I did when I was 26, 27, or 28, I cross train pretty much all the time. Tons of yoga, lots of kettlebell, and at least ten miles of dog walking each week. It all adds up, as this race proves. 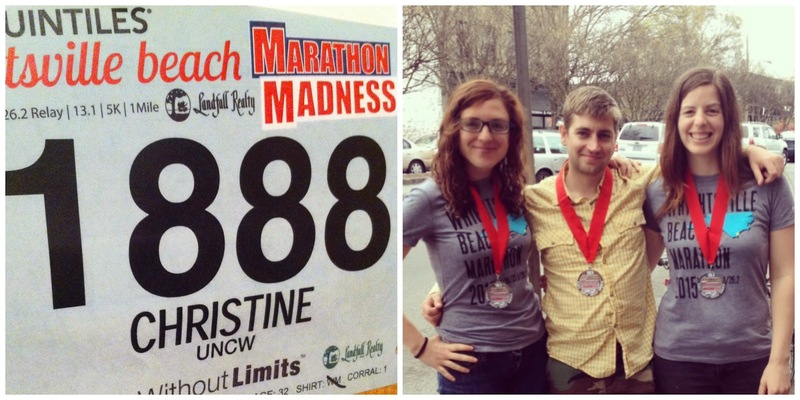 As for the race itself, I ran it with Nathan and Katie. We'd trained together for the last few months, meeting every Sunday for a long run around Greenfield Lake. Last year, Katie and I ran the race side by side until mile 11, when I pulled ahead and finished a minute or so before her. This year, we split up at mile 3 because she was running a faster race than me and I knew I couldn't keep up. Nathan did the same, because he's always faster than me. So I made sure the two hour pace group was behind me (breaking two hours is always my secret goal) and settled in. At around mile 7, Nathan suddenly appeared beside me. He'd had some stomach issues and took a detour in a port-a-potty. We ran together for a few miles, then he pulled away. At around mile 10, I saw Katie up ahead, but she was holding steady and I decided not to try catching up. I was having a hard enough time holding on to my pace - I'd been averaging sub 9 minute miles the whole time, much to my own surprise, and knew that if I could just keep it going until the end, I would break my personal record. I ended up crossing the finish line 11 seconds after Katie, and two minutes after Nathan, for an official time of 1:56:28, an average pace of 8:54, and a new PR. Not bad for a Sunday morning. 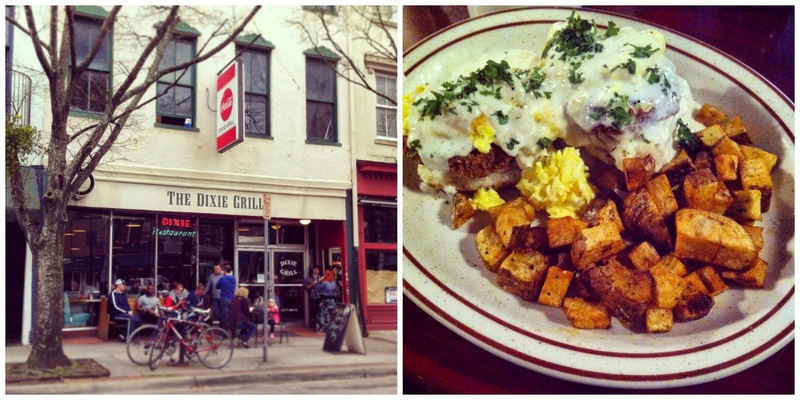 After the race we went home, showered, and then met up at the Dixie Grill for our traditional post-race breakfast. I always order the Dixie Benedict, which is a biscuit, topped with a fried green tomato, covered in scrambled eggs, and smothered in Vidalia gravy. I want another one right now just thinking about it. Later that day I took a nap, drank porch beers with friends, and went to bed early. In other words: a perfect day. This part of the post is for running nerds who like stats. I set my previous half marathon record FIVE YEARS AGO, in 2010, at the Davy Crockett Beach Chase, with a 1:58:21. (Which is still one of my favorite races.) As for the Wrightsville Beach Half Marathon, last year I finished in 2:00:20, and the year before that in 1:59:31, so a 1:56 finish is a pretty big improvement! All in all, a fun and successful race. I'd love to hang up my medal and my running shoes and rest on my laurels, except we accidentally signed up for another half marathon, on April 18th. I don't know if I can PR twice in one season, but if this race has taught me anything, it's that you never know. Also that the post-race brunch is worth almost any distance.